"Madman" Larry Aarons grew up in a tough New York neighborhood a few blocks away from Fort Apache in the South Bronx. He began his life as an artist in kindergarten when his teacher took away his crayons. They were apparently being used on everything but construction paper. In the 60s Larry went to art school where he studied illustration under some of the greatest painters and designers of the time: Harvey Dinerstein and Milton Glaser, among others. He flourished in that atmosphere, soaking up ideas about advertising. That's when he took a detour onto Madison Avenue. He says, "I worked with, learned from and listened to hundreds of great creative minds, but I owe my entire ad career to a giant of the era, Stan Dragoti from Wells, Rich Greene. He gave me the start every kid dreams of." Larry went on to become a creative force in many of New York's best and finest ad agencies. "I loved what I did; it was an honor to be part of the greatest generation of creative minds that ever walked the walk and talked the talk." 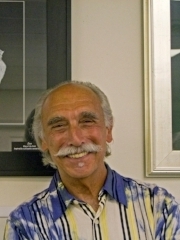 In 2012, after 50 years, Larry Aarons returned to his crayons and now enjoys a successful career as a full time artist. Visit www.larryaaronsart.com to see more of his work. "I want to say how proud I am to be part of AdVets for WarVets."